I reorganized my paints yesterday after fervent months in the studio painting the work for Mystery Train. Tubes of oil paint squeezed into empty twisted shells and stray caps marked only by a tell tale ring of color were discarded. Brushes, newly cleaned, stand at attention ready for new work. A clean glass palette now sits on top of a used stack of brightly daubed surfaces. 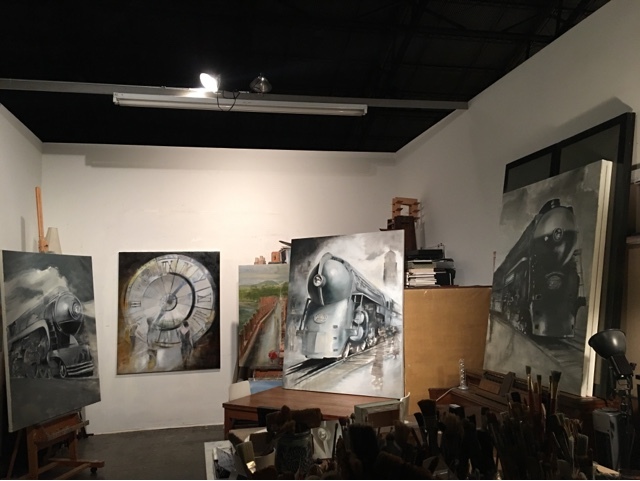 Painting trains seems to bring daily reminders of change, of process, of journeys. When a train or plane turns around for its trip back home, there is little time for introspection. Vehicles are cleaned, engines refueled, often a new crew is added - new passengers and new travels await. As Mystery Train prepares to depart San Francisco, I ask you to celebrate with me at a closing party and artist talk on February 27th at the Sandra Lee Gallery (details below) if you are in the Bay Area. 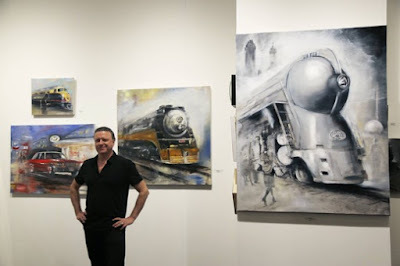 I have listed below a series of events, exhibitions, press, and more that give a glimpse into the excitement around Mystery Train and my art. Thanks for taking the time to look at and ponder my paintings! Santa Monica-based artist Gregg Chadwick has been painting for three decades. 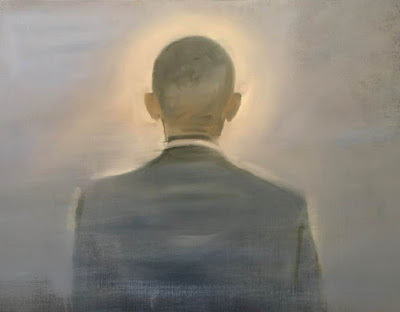 His current studio is an old airplane hangar where the flurry of takeoffs and landings on the runway outside seems to creep into Chadwick’s paintings as he explores movement and travel within his light-filled paintings. 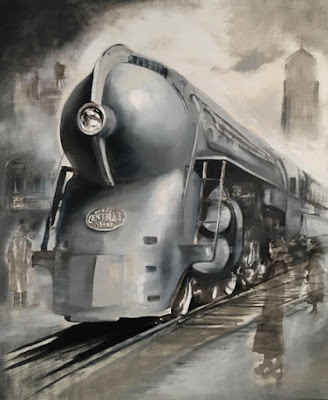 His current series of paintings is entitled ‘Mystery Train’ and evokes the railways of America that Chadwick says run in his blood. His grandfather worked as a fireman, stoking coal in steam engines before advancing to train engineer on the Jersey Central Line. Chadwick often says that family gatherings brought the rhythms of the rails home. The sounds of railroad workers echoed in the music that Chadwick’s relatives played in the shadows of the train lines outside. For Chadwick and many others such as writer Greil Marcus, filmmaker Jim Jarmusch, and musicians Junior Parker and Elvis Presley, the enduring mythos of America and its legacy is wrapped in the blues notes of the song ‘Mystery Train’. Chadwick will speak about these influences and how they shaped his current paintings. 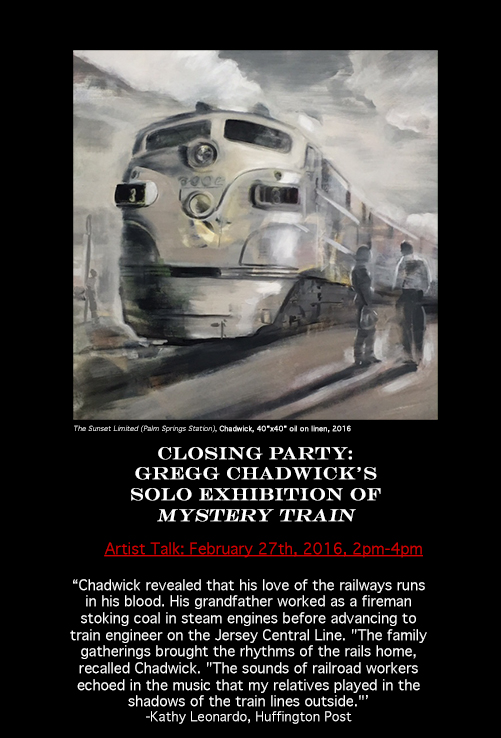 Sandra Lee Gallery: Mystery Train - Gregg Chadwick. Comment by AB: "Dreamy dynamic portrayals recall the heyday of rail travel and the nostalgia it evokes." 5. 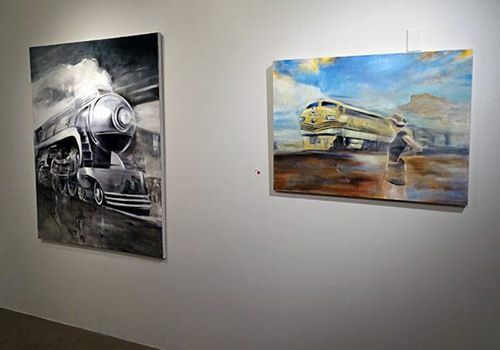 A selection of Gregg Chadwick’s paintings from the Mystery Train series was exhibited at the Palm Springs Fine Art Fair from February 11-14 in the Sandra Lee Gallery booth. (Photo by Eric Minh Swenson) Gregg spoke at the booth on February 12, 2016. Jersey Rain (Across the Tracks) was illustrated in the catalog and Gregg’s talk was featured as well. 6. A solo exhibition of Gregg Chadwick’s paintings entitled Cities in Time, hangs through March 2016 at Vedder Price in Century City, California. 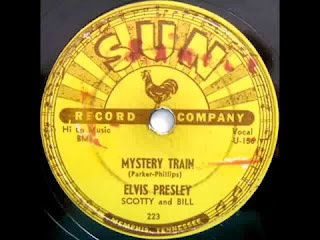 Gary Clark Jr.’s vocals and guitar carry the themes of my show “Mystery Train” directly into our present. Haunting and at times wild with a searing beauty. Almost every night as my hands grew tired from painting, Gary Clark Jr. propelled me to go on just a bit further. A selection of Gregg Chadwick’s paintings from the Mystery Train series was exhibited at the Palm Springs Fine Art Fair from February 11-14 in the Sandra Lee Gallery booth. (Photo by Eric Minh Swenson) Gregg spoke at the booth on February 12, 2016. Jersey Rain (Across the Tracks) was illustrated in the catalog and Gregg’s talk was featured as well. Read More on Mystery Train in the Wall Street International.